But as the days pass and the walls of Andi's apartment close in, Clare begins to wonder if it's really love that Andi is searching for … or something else altogether. 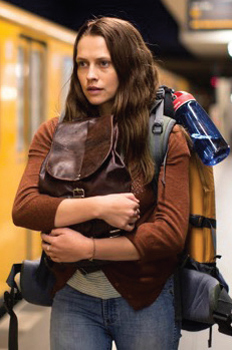 Berlin Syndrome is a closely observed and gripping psychological thriller that shifts between Andi's and Clare's perspectives, revealing the power of obsession, the fluidity of truth, and the kaleidoscopic nature of human relationships. Melanie Joosten works at the National Ageing Research Institute in Melbourne. Her debut novel, Berlin Syndrome, saw her named a Sydney Morning Herald Best Young Novelist and receive the Kathleen Mitchell Award; it will be released as a major motion picture in 2017. Melanie holds a Master of Arts and a Master of Social Work.